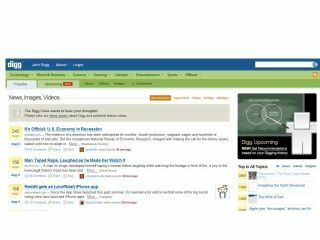 The CEO of news aggregation site Digg.com, Jay Adelson, has announced that the site is no longer for sale. There's been much rumour and speculation in recent months about whether Adelson would think about selling the website, with Google being mentioned as prime contender. But in an interview with BusinessWeek, he has once and for all quashed the chit-chat, stating that the focus is now on making the site more profitable. There are a number of plans afoot to rake in the moolah, and these include selling ads on RSS feeds – something the company has already implemented. It is not all about advertising, however, with Adeslon pointing out that community is the key to Digg's success. "I'd rather get more revenue by getting people to hang out more than by serving more ads," explained the CEO. It's not as if Digg is struggling to make a profit, though. In the last year the website has said to have tripled its revenues and an upbeat Adelson expects "another tripling if not more" in 2009.